Hamilton Beach Oval Slow Cooker Just $9.99! Down From $33! 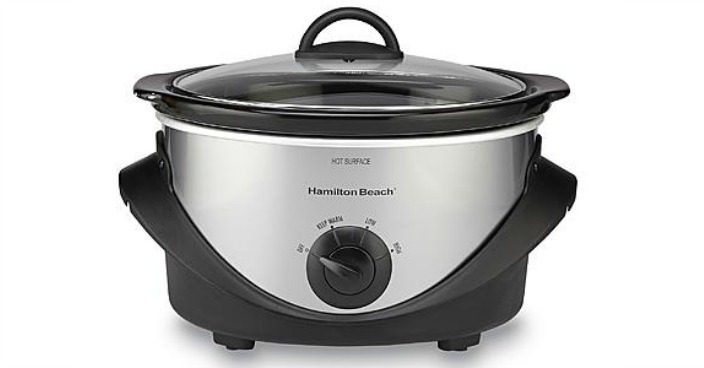 You are here: Home / Great Deals / Hamilton Beach Oval Slow Cooker Just $9.99! Down From $33! Sears has this Hamilton Beach Oval Slow Cooker on sale for $9.99 (Reg. $33)! Please keep in mind that this great deal is available for FREE in-store pickup only ! The Hamilton Beach four-quart slow cooker makes delicious meals easy, with little planning or preparation. The four-quart oval stoneware is compact, yet large enough for a four-pound chicken or a three-pound roast. You can also use the stoneware in the oven or microwave. Just add your ingredients and walk away. There’s no stirring required to create a dinner your family will enjoy. Choose from three heat settings, and your slow cooker will blend flavors and tenderize meats as they cook. Recipes are included to inspire you to try new things, and cleanup is a snap because both the stoneware and lid are dishwasher safe.